A lot has changed since Jeremy Corbyn won leadership of the Labour Party two years ago. His vision hasn't. For a limited time, Jacobin readers can buy The Candidate from OR Books for 20 percent off — just use coupon code Jacobin on the last page of checkout. It has been an incredible few weeks for Jeremy Corbyn. Widely written-off by the political commentariat as a no-hoper when Theresa May called the snap election, he is now a prime minister in waiting, leader of the most popular party in Britain facing a weak and unstable government. The pace of political events make September 2015, when Corbyn first won leadership of the Labour Party, seem like an age ago. But the foundation of his recent success was laid then — with a political vision that he deviated little from in the intervening two years. Alex Nunns, the author of The Candidate: Jeremy Corbyn’s Improbable Path to Power, was one of those who saw the project develop from its earliest stages. Here he talks to James Elliott, editor of Labour blog Left Futures, about the extraordinary general election campaign, the future of Corbyn’s Labour Party, and the path to left government in Britain. Your book focuses on how Jeremy became leader in that first campaign. It was criticized at the time as only being applicable to the half a million people who took part, but in this general election a similar strategy won Labour almost thirteen million votes. How do you see the relationship between the two? The leadership campaign, especially the first one, and the general election campaign we’ve just had, are expressions of the same phenomenon but there are distinct features of each. I think there was a tendency among political commentators to regard what happened in 2015 in the Labour Party as if it was a political nervous breakdown, as if everybody in the Labour Party had lost their minds, or it was a takeover of the party by entryists. There was no evidence for a takeover, because there weren’t enough people who came into the Labour Party to outnumber existing members anyway, but the first one persisted. There was this sense that there may be an anti-austerity movement and an antiwar movement that animated people on the left, but this is restricted to a tiny group of people. I remember seeing Julia Hartley-Brewer on Sky News saying everybody who would vote for Jeremy Corbyn was already a member of the Labour Party, this is when we had about five hundred thousand people in the Labour Party. The general election has completely destroyed that idea. Political analysts, right up even to professors, looked at the Labour Party as if it was some kind of controlled experiment, apart from society, a closed organization in which phenomena can take place where there’s no read across. In actual fact, the Labour Party is part of society, predominantly not well-off people, but those who may be in education, or working in the public sector, or who are experiencing pay restraint in the private sector or who are in trouble with housing. The issues which animated Jeremy Corbyn’s campaigns, both the general election and the leadership elections, were real ones that affected people in the Labour Party and continue to affect people who aren’t in the Labour Party. This is actually a generalized phenomenon, millions of people feel the pressures that propelled Corbyn to the leadership of the Labour Party. The media is a major theme of the book. You point out how columnists who’d previously been seen as on the left of the commentariat at publications like the Guardian or New Statesman entirely dismissed the political events that were happening. Why do you think they failed to explain the movement then, or indeed two years later during the election? Firstly, these people, especially the comment writers, but this applies to most journalists, aren’t impartial observers on the sidelines of politics. They’re active participants in it, and what they write shapes the political debate. They have a position within that system. They were opposed to Jeremy Corbyn because they saw him as a political threat. If you look at somebody like Polly Toynbee or Andrew Rawnsley or similar commentators at the Guardian and Observer, their analysis was in line with their political position. I think there’s also a structural factor in the media. It’s obvious in cases where an outlet like the Sun is owned by a billionaire. You can see they have their own interests and the journalism they produce reflects those interests. But even with publications like the Guardian, which is owned by a trust, they serve a particular function — they are part of official civil society, which breeds a certain responsibility to established political and economic power. The BBC, as a state broadcaster, is even more enmeshed in this. I think a third factor relates to the journalists themselves, the clique that exists. I don’t think it is inconsequential that many went to a small group of schools and the same universities. The media industry in the UK is also hyper-concentrated in London. So you get a very narrow selection for a limited number of jobs. That means a kind of network from paper to paper, media organization to media organization, competing for the same jobs, knowing many of the same people, being from the same background. This situation leads inevitably to groupthink. The most recent example was the unshakeable faith that elections are won from the center. This notion persisted despite the fact that, in the 2015 election, where the Conservatives got a majority, they were perceived by the public as being “eight” on the left-right scale, where zero is left and ten is right. That is a long distance from the center. So, it should have been clear this way of thinking didn’t work long before Brexit or the recent general election. Do you think there’s a scope for creating a “new media,” on the left, woven out of social media and this mass constituency for left politics? There definitely is, but the trouble is left media doesn’t have the same kind of resources. There are independent, left-wing outlets in Britain such as Novara and Red Pepper, who produce good-quality content but they haven’t got any money, and there are provocative news sites like the Canary, Skwawkbox, and Evolve Politics that get wide audiences. But there isn’t the money for new, left-wing media that there is for its right-wing equivalent. Even the Guardian is running a massive loss but it’s got the Scott Trust behind it with millions of pounds to employ people. So new media is at a huge disadvantage in terms of being able to pay journalists, pay for research. But the traditional media is definitely losing ground rapidly. The public’s confidence in it is much lower than before and a lot of people are looking elsewhere. Every year this dynamic deepens, it seems. In the election the established right-wing press threw everything at Jeremy Corbyn and it didn’t make much difference. The liberal press, particularly the Guardian, belatedly realized that their entire readership was backing Jeremy Corbyn and changed their tune. Their coverage was far less hostile than it had been. I think some of that shift was also necessitated by the fact that there were now alternative sources of information out there that they had to compete with, so they had to be more responsive. Returning to Jeremy Corbyn — he has been leader of the Labour Party for almost two years now. This is probably the most secure he has been in that position. But what has he failed to do during his tenure, what opportunities has he missed? I’ve always been wary about the rush to criticize the missed opportunities of Jeremy Corbyn’s leadership which a lot of people on the Left did. I think a lot of the criticisms don’t give due weight to the reality that the leader’s office has been operating in an impossible situation. They did make mistakes and they weren’t as efficient as they should have been at times, but then these are people who came into the leadership of the Labour Party, not just John McDonnell and Jeremy Corbyn, but also the staff who were brought in, who had no experience of running a leader’s office. They weren’t given the kind of guidance and support that previous leaders might have had either, because huge sections of the Labour Party bureaucracy and its more experienced people were hostile to them. I think more political capital could have been expended on trying to reform the party. We’ve just been through an election where Labour got an incredible result. It achieved that on the back of a left-wing leadership and grassroots movement that, in many if not most cases, was not reflected in the local party or the candidate elected. I think there’s a case to be made that it could have been even more successful if there had been reform earlier. Perhaps there was the opportunity to do that after the second leadership victory which wasn’t taken. But these things are really hard calculations. As you say there, at times Corbyn has led the party, but not wielded power over it, and has been held back by its structures. What steps do you think Corbyn now has to take to assert control over the party to ensure we’re in a better state for the next general election? I can say what I think would be helpful. I think the fact that the National Executive Committee (NEC) has got just six constituency representatives when the membership is over five hundred thousand is an outrage. The first step should be reforming the NEC so there are more member representatives on it. The general secretary should also be elected by party members rather than by the NEC. Once we have those things in place, the party will be much more democratic. The general secretary employs staff and, as we know, there’s been an unacceptable situation where sections of the staff have not been working for the current party leader. I’m not saying people have to lose their jobs — an elected general secretary might be enough to change attitudes. Once these crucial parts of the party have been made more accountable to the membership, I think reforms can be taken on a step-by-step basis. The manifesto was a huge success and if it were enacted would improve millions of lives. It’s similar in content to the manifestos and documents of Corbyn’s two leadership campaigns — but compared with party manifestos in the 1970s or the time of Tony Benn, it’s more moderate and social democratic. Do you think there’s scope for the Left to build on the manifesto, and what issues need further development? The manifesto is a fantastic achievement, particularly for [Corbyn advisor] Andrew Fisher. The similarity you raise between it and the documents during the leadership campaigns is interesting. A lot of the policy originates from the first leadership campaign, when Andrew Fisher was actually working at PCS [trade union] and managing to turn out a huge number of documents which formed the skeleton of the general election manifesto. It is significant that these same policies which gained traction inside the Labour Party in 2015 have now gained traction in wider society. It was a radical manifesto in UK terms, in the context of our political culture since Margaret Thatcher. It does represent a turning point where clearly left-wing demands can be placed on the agenda and embraced by huge swathes of people. It’s not especially radical in the context of historic manifestos of social-democratic or socialist parties but we have to be aware of the moment we’re in. Many of the demands of the 1970s have retreated a long way beyond the horizon. What we have in the manifesto is a fundamental challenge to the Thatcherite consensus, it would be a huge victory if we were able to implement it. There were critics of Jeremy Corbyn who saw that manifesto and said, “This is everything I believe in but we will never be able to get people to vote for it.” Well, people won’t say that anymore. 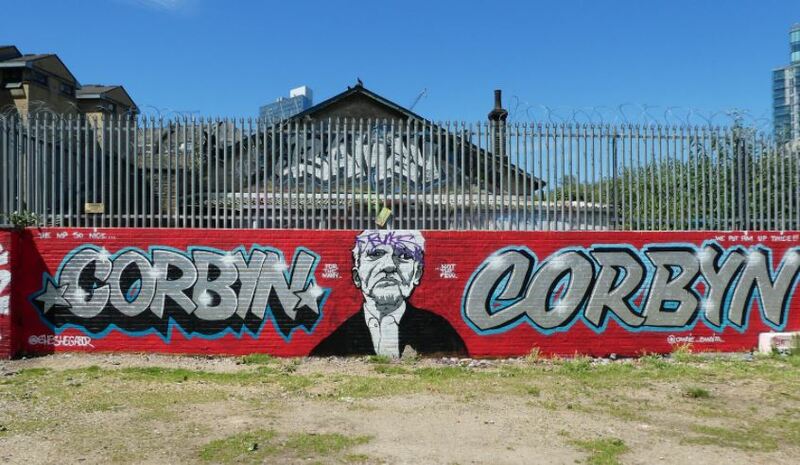 The 1983 ball-and-chain [the legacy of Michael Foot losing comprehensively on a left platform] has been broken. We now know people will vote for radical policies if they improve their lives. The Left made some compromises, of course, and we’ll have to see how that plays out. But I think the manifesto was pitched perfectly for the country. And it gave Labour members pride and heart and belief that they were fighting for something they actually believed in. Finally, knowing the key players in the Corbyn camp, how do you think they would respond to the challenges of left government? Are there any particular experiences you think Jeremy, John, and those around them would draw on? I don’t think they would be naive about it. A Labour Party that actually challenges entrenched power and governs for the broad mass of the people will face significant resistance. If we got into government the movement behind the Labour Party and Jeremy Corbyn would have to step up and exert itself in society. You can’t just leave someone in number ten to implement your program, that’s not going to work. There has to be a broad expression of social power behind the left government or it would get crushed. A lot depends on timing. Brexit is obviously somewhat chaotic at the moment. In this general election the business community didn’t mobilize for the Conservatives so much, they gave them money but didn’t intervene as they had in the past. I think that’s partly because they were worried about the idea of a hard Brexit. For a lot of business interests in Britain that would impact the bottom line. It isn’t clear how the social forces are going to stack up in such an unstable situation. If there is another election and Labour are favorites to win, things will look quite different. But the Tories might hold on for two years or more and by then the context could have changed a lot. We need to prepare for whichever eventuality comes to pass. Getting into government isn’t the end of the job, it’s only the start. That’s when huge mobilizations will be needed to defend Corbyn’s platform because, for Britain’s elite, a lot of power and wealth will be on the line. Alex Nunns is a correspondent at Red Pepper and the author of The Candidate: Jeremy Corbyn’s Improbable Path to Power . <a href=“https://twitter.com/JFGElliott?ref_src=twsrc%5Egoogle%7Ctwcamp%5Eserp%7Ctwgr%5Eauthor” James Elliott is the editor of the blog Left Futures .